Paddl Co. is a talent platform designed to help emerging talent become professionals by enabling them with opportunities to gather real-world experience as well as provide businesses with powerful tools to filter and recruit their next generation of employees. Paddl seeks to challenge the norm in traditional recruitment processes by showcasing actual talent rather than experience written out in a CV. In the hospitality industry especially, Paddl has taken the initiative to revamp the way employers hire by engaging them in a front and centre skills challenge. This Spring, Paddl Co. partnered with Blakes Feast Catering, a leading catering company in Melbourne who pride themselves on creating ‘food worth celebrating’. Blakes Feast were looking to source the best talent possible to execute a flawless Cup Carnival. Paddl Co. developed the Paddl x Blakes Feast Skills Challenge - a set of engaging challenges that saw candidates evaluated on their practical hospitality skills in a variety of situations. 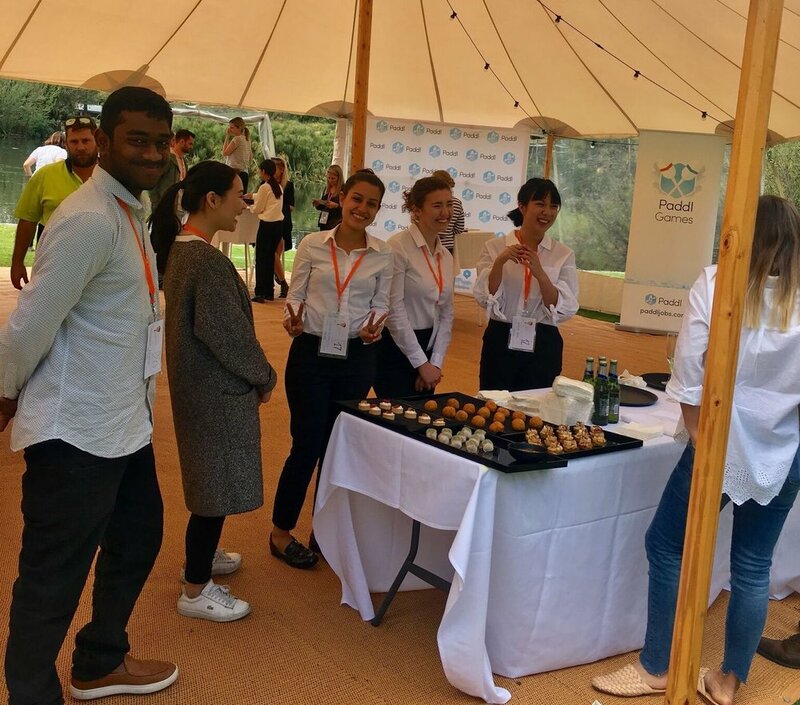 The challenges were so effective, Blakes Feast were able to hire 37 skilled Paddlrs on the spot, truly revamping the way the hospitality industry hires! Removing the pain and process of resumes and individual trials, Paddl designed a set of three practical and catering-based challenges that allowed Blakes Feast to view and assess the candidates in real time. The roving judging panel monitored the candidates in various settings, taking notes on a range of performance criteria. Participants were even requested to come in a set uniform on the day, so elements such as presentation and punctuality could be assessed. Paddl created a simulated cocktail party environment, with scrunched napkins and empty glasses around the room. 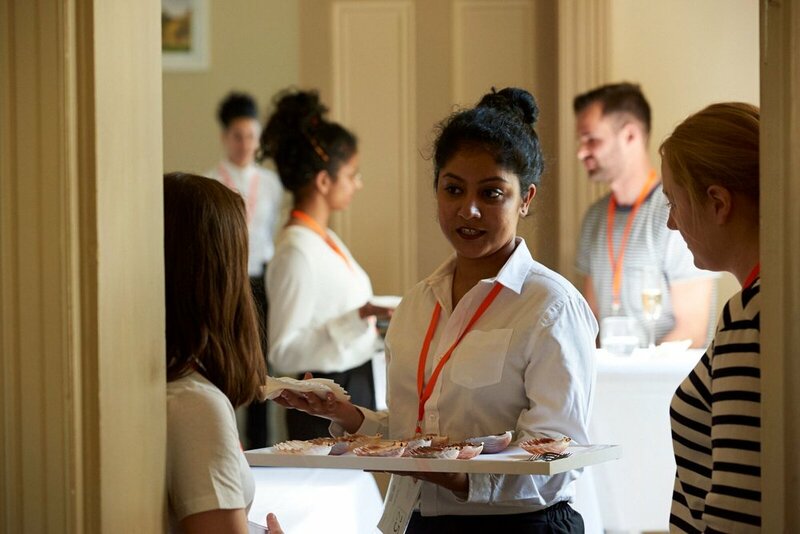 Participants had to weave through guests and furniture with speed and efficiency as they moved a tray of glasses to the clearing station; all the while being professional, personable and engaging as they went. Judges were looking for confidence and ease of movement through a crowd with a tray full of glasses; and other observation skills such as collecting empty glasses, offering top-ups or new drinks, a friendly demeanour and first class service. In a similar cocktail party environment, participants navigated through multiple rooms this time, between guests and furniture, serving food to the crowd. Participants also had to be aware of dietary requirements of the food items they were holding, whilst also engaging politely with guests. Here, the judges were looking for ease and confidence in explaining the food selection; crowd management with a tray of food; friendly and first class service; and the ability to deal with unexpected questions from guests in an appropriate manner. The final challenge had participants complete the full cycle of service for a table of five, with only three guests present. Participants had to demonstrate an understanding of a formal table setting by selecting the correct cutlery, pouring water and then wine, and adding or remove plates and glasses as needed. In this particular setting, judges were looking for an understanding of the full cycle of service, correct cutlery queues, pouring etiquette, engagement and a professional demeanour. There were a couple of unexpected requirements designed to truly test the candidates. Full table service involves knowing the different table settings between courses - for example bread knives and plates may stay through main course, but must be removed before dessert, as should the salt and pepper. All clearing had to be done promptly to an outside station, where cleanliness and efficiency was also evaluated. The purpose of the three separate challenges was to assess the different styles of service to be offered by Blakes Feast through their various venues at the Cup Carnival. This allowed for skilled applicants to how their diversity and adaptability to situations. It was truly a remarkable day with 77% of candidates were hired on the day! There were 12 Blakes Feast crew in attendance, alongside 5 Paddl Crew members, who did an excellent job of executing and judging all the challenges. The success of the Paddl x Blakes Feast Skills Challenges marks a new way in which hospitality hiring can be assessed - a show and tell of talent! In an industry where personality fit and actual skills go hand-in-hand, the evaluation approach put forth by Paddl was exceptionally executed. The Blakes Feast Skills Challenge gave all participants a chance to consolidate their skills, network and the opportunity to learn where a career in the hospitality industry could take them! "Paddl Co. have revolutionised the way we see the hospitality industry talent pool and how we hire. We are SO thrilled with the results and we recruited over 75% of the applicants on the spot and the quality of the applicants was excellent! It was such a fun day as well!"